Uedaite-(Ce): Mineral information, data and localities. Named in honor of Tateo Ueda (上田健夫) (1912-2000), Japanese crystallographer and professor at Kyoto University, who determined the structure of allanite. A member of the Allanite Group of the Epidote Supergroup. Mn2+ analogue of Allanite-(Ce). The composition fits to the unnamed phase 'UM1957-02-SiO:AlFeHMnREE'. Brown to yellow. Y = b.
b-axis and less than 1 mm in length. Miyawaki, R., K.Yokoyama, S. Matsubara, Y. Tsutsumi, A. Goto (2008) Uedaite-(Ce), a new member of the epidote group with Mn at the A site, from Shodoshima, Kagawa Prefecture, Japan. European Journal of Mineralogy: 20: 261-269. Miyawaki, R. (2006) A Mn-analogue of allanite-(Ce) in granite from Japan. IMA General Meeting, Kobe, July 2006, poster 31-9, abstract # 90168. Piilonen, P.C., Poirier, G., Tait, K.T. (2008) New mineral names. American Mineralogist: 93: 1941-1946. YAKOVLEVA, O.S., PEKOV, I.V., HORVÁTH, L., BRYZGALOV, I.A., YAPASKURT, V.O., and GUSEVA, E.V. (2010b) Mineralogy, geochemistry and genesis of high-alumina fenites of the Mont Saint-Hilaire alkaline pluton, Québec, Canada. Geology of Ore Deposits, 52, 795-805. 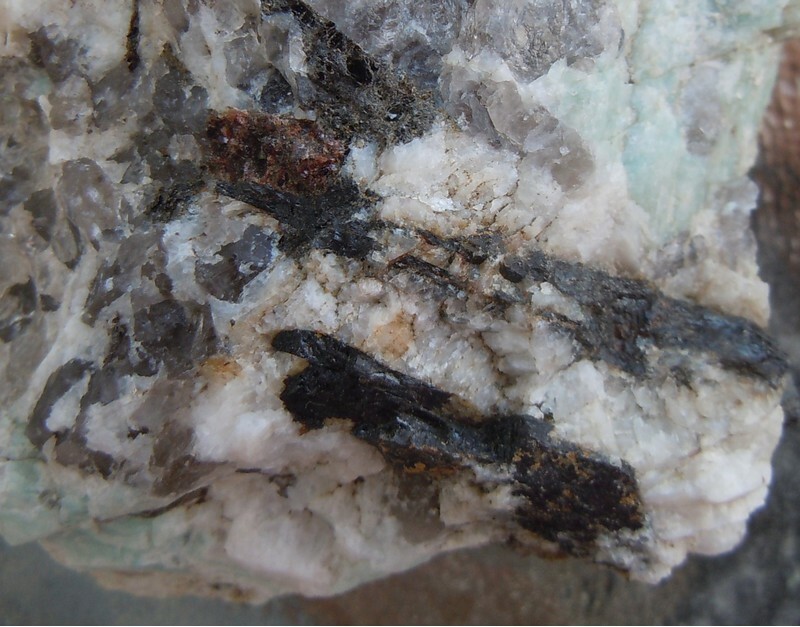 Miyawaki, R., K.Yokoyama, S. Matsubara, Y. Tsutsumi & A. Goto (2008): Uedaite-(Ce), a new member of the epidote group with Mn at the A site, from Shodoshima, Kagawa Prefecture, Japan. Eur. J. Mineralogy 20, 261-269. Roy Kristiansen collection (photo-755017); Kristiansen, R. (2017): Fire nye mineraler for Norge. Stein. 44 (1): 24-27; Kristiansen, R. (2018) Nye mineralfunn fra Heftetjern-pegmatitten. Norsk Mineralsymposium 2018: 79-92.